Everyone kno ws that this pre Rosh HaShana period is a time for intensive soul searching. There are many advices about what this entails. 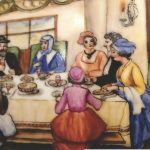 It’s important to seize the moment, for on Rosh Hashana we receive our allocation of spiritual resources for the coming year (both individually and collectively). The great CEO (Chief Executive Officer) in the sky gives each one of us a budget of “lights,” based on our past performance, and our proposals (our prayer-visions) for the coming year. To help us with this holy work, we are told that HaShem has left his fortified, bureaucratically protected palace, and is available in the field. Kind of like during sukot when the President of Israel has an open house, and anyone can approach and have a moment of consultation with the Head of State. Any other time of year a person is screened by many layers of bureaucracy. But it’s not only that HaShem is more accessible to us, says R. Tsadok; the reverse is also true. We are more accessible to HaShem, in the sense that our souls (and psyches) are more receptive to the flow of communication emanating from on high. 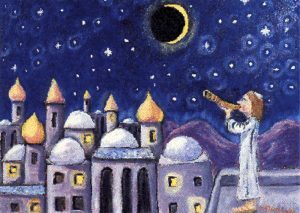 He explains as follows: Rosh HaShanna is the anniversary of HaShem’s vision of perfection for the universe and for each of its individual inhabitants. And each year at this time HaShem reformulates a new, mini-vision of the highest that is possible for us this coming year. And yet, according to kabbala, our original Genesis did not happen smoothly. There were actually seven universes created and destroyed before our own. These shattered worlds were the deliberate means by which HaShem fashioned the raw materials out of which our world is built. According to kabbala, we are the resurrected shards of these fallen worlds. And so, says R. Tsadok, this entire cycle repeats itself each year in Elul (the month preceding Rosh HaShana). HaShem is again forging raw materials for the new vision that will be born for us this coming year. This creative churning that is happening within Divinity at this time, is sensed by our souls down here below. And HaShem gives us major hints about what we should pray for, both in a positive sense and negative sense, by awakening in us specific yearnings and fears. R. Tsadok instructs us to pay especially careful attention to the stream of thoughts, concerns and longings that pass through our heart-minds at this time. In Elul they reflect HaShem’s whisperings to our soul much more than usual. 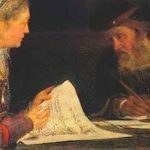 The work of Rosh HaShana preparation then, says R. Tsadok, is to take these Heavenly hints and weave them into a prayer vision for the coming year that is verbalized as prayer. It should not only express our longings, says R. Tsadok, but should also include the positive counterparts to our fears. He says that especially during the pre New Year period HaShem may communicate what he wants us to pray for by causing a fear to awaken inside us which becomes a clue that he wants us to pray for the positive antidote of that fear. For example a fear of financial collapse would signal that HaShem wants us to pray specifically for a prosperous year. A fear of illness means that HaShem wants us to pray specifically for a healthy year, etc. And this is the work of this time, to create a list of prayers and resolutions that reflect our specific hopes for ourselves and our loved ones and our holy people, Land, and planet this coming year. The more thoughtful the vision, the more likely that it will accurately reflect the Creator’s vision and the more powerful it will be. So I want to bless us, as individuals and as a community, that we open our hearts and our minds to HaShem’s communications to us at this time. That we catch His hints and turn them into holy prayers that pierce the firmaments and sweeten the harsh decrees at their root. May the combined power of our prayers and visions transform our lives in ways that are only good. And may they create a vessel of vision and yearning that is big enough and strong enough to embrace our individual and collective destinies, and to pull mashiach into the world now.